Eagles Palace is a luxurious (5 stars) resort hotel of 100 rooms and 64 suites and bungalows – several of the suites having private pools – that is situated in a picturesque location in the peninsula of Athos only 4 kilometres away from Ouranoupolis Halkidiki and 110 km from the “MACEDONIA” airport of Thessaloniki. 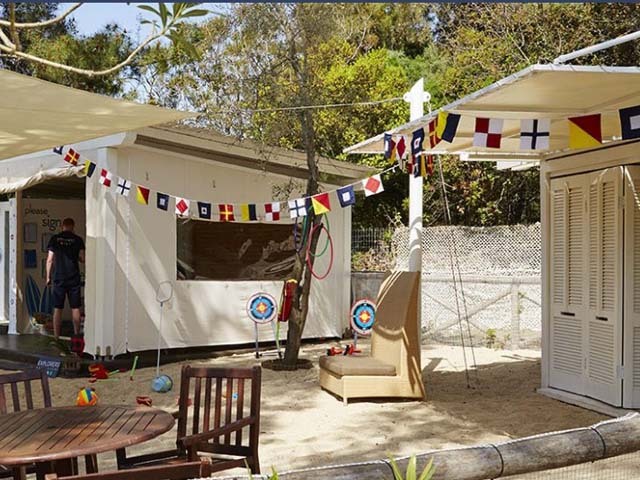 Its private idyllic beach is awarded with the Blue Flag of Europe and has service. 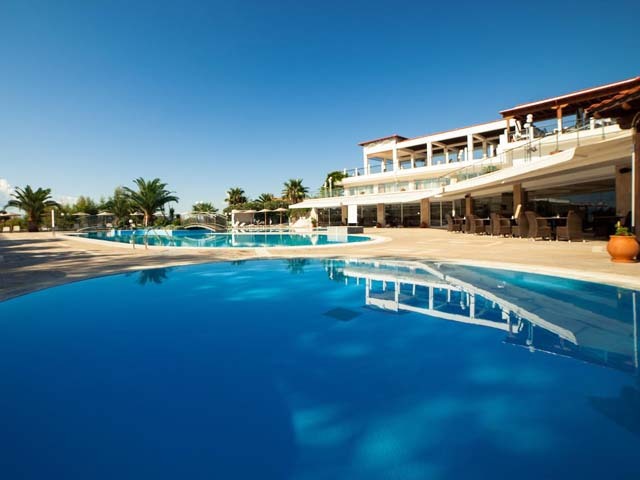 The rich blending of Eagles Palace facilities include a Nautilus gym with sauna, hydro massage, Turkish bath and laconium, internal and external pool, tennis, sea water pools, scuba diving, beach volley, sea sports school, sea transfer service, Kids’s Club, boutique and Jewellery corner, ample parking space, port and heliport. All types of rooms provide to our guests: room service throughout the day, breakfast, lunch, dinner in their room, medical services, wireless Internet, satellite TV, direct call operator, radio, safe, mini bar, air condition, bath amenities, bathrobe, beach towels, hairdryer, butler bath menu, laundry services, baby cot (on request). 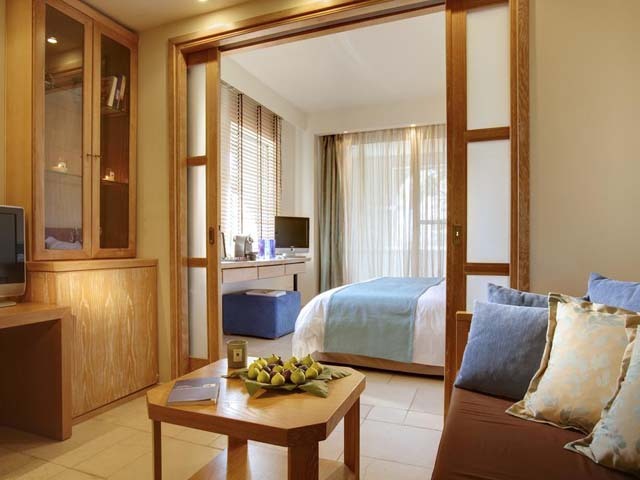 Suites and bungalows are equipped with Nespresso coffee machines and LCD TV. 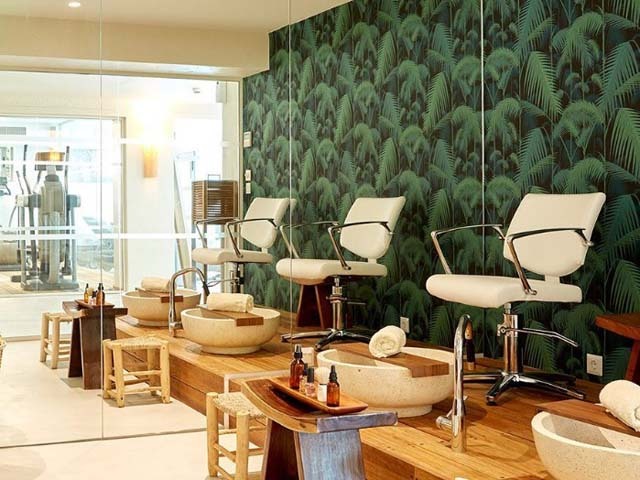 This year Eagles Palace holds a lot of surprises starting with the new Eagles Spa where the products and the experience will be provided by Elemis, the leading British company in spa treatment, carrying the title of the best Day Spa in the world. 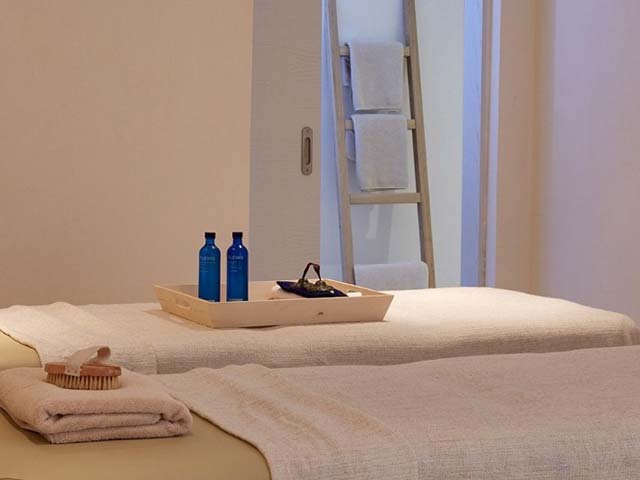 Enjoy unique moments of relaxation by leaving yourself in the hands of specialist staff either for a wonderful and rejuvenating massage or for sauna, spa, hamam, laconium and thalassotherapy. Finally there are also available conference rooms with state-of-the-art technical equipment, with ability to host from 10 to 220 persons. 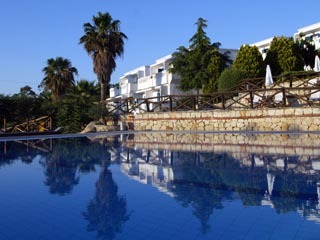 A significant number of multinational and Greek firms as well as international organisations choose Eagles Palace as a venue for organising conferences for the luxury and comfort of its rooms and common area, its exceptional cuisine, its fully equipped conference center and the high quality of services provided by the trained and experienced staff and all the participants can benefit from the hotel facilities, as well as the various activities offered to our guests. 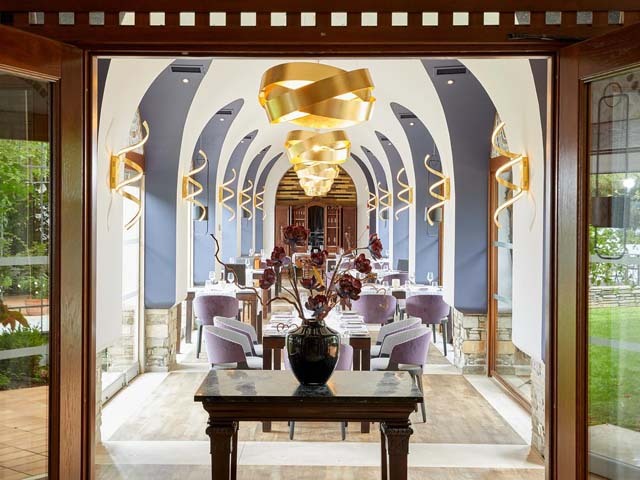 Last but not least, Eagles Palace has the infrastructure and the experience to provide unique VIP & Executive luxury services to its prominent clients, including private trips to hardly ever visited Monasteries at Mount Athos. 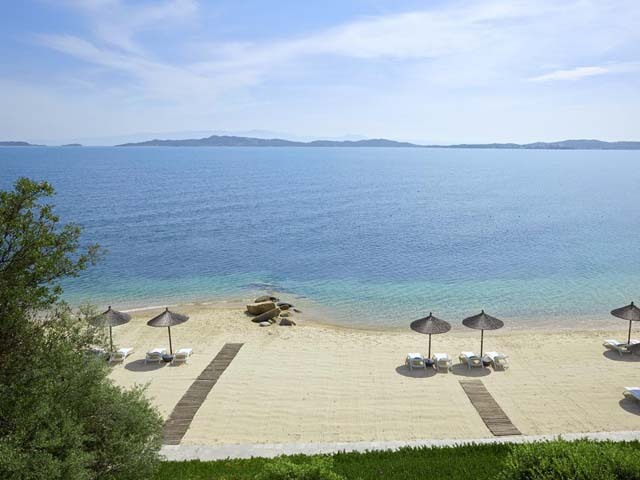 Eagles Palace, is located in the picturesque village of Ouranoupolis, Halkidiki in Northern Greece. 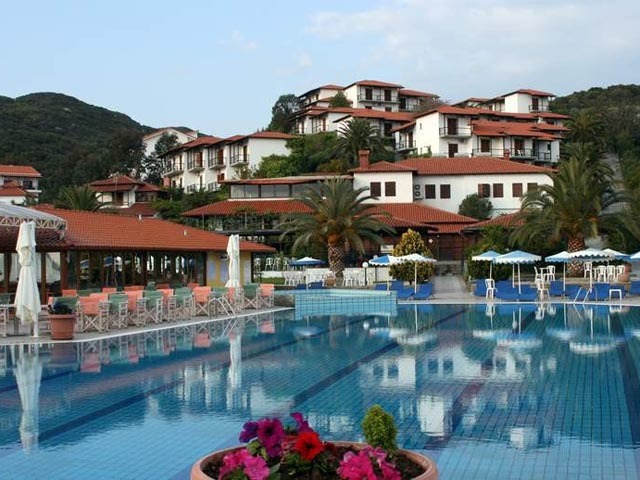 Situated on the third and most charming peninsula, Eagles Palace is amongst the top Macedonian Hotels, not only for its supreme service and facilities but also for its breathtaking surroundings which include the mystique Mount Athos and the superb greenery of Northern Greece. 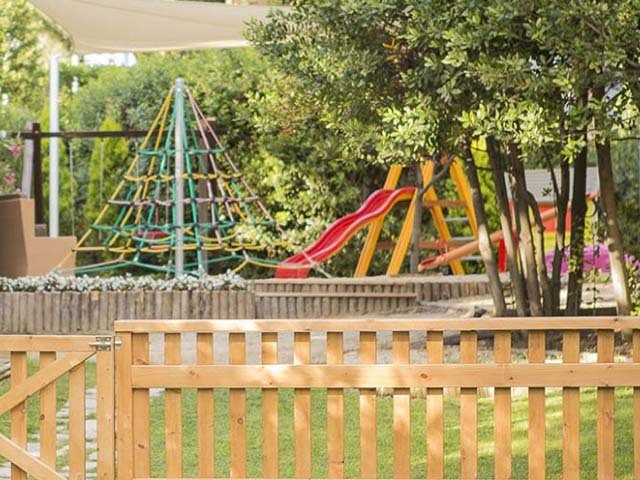 The hotel can be reached by Thessaloniki, the beautiful capital of Macedonia in Greece. The Thessaloniki International Airport-Macedonia in Greece is very well connected with domestic as well as international flights. Whichever way you choose to reach our hotel, there are many beautiful sights on your way to our premises, in Macedonia, Greece. As you reach our hotel, the breathtaking Mount Athos will stun you with its beauty and powerful presence. Choose the route that suits you best and begin you journey to the majestic Mount Athos in Greece. 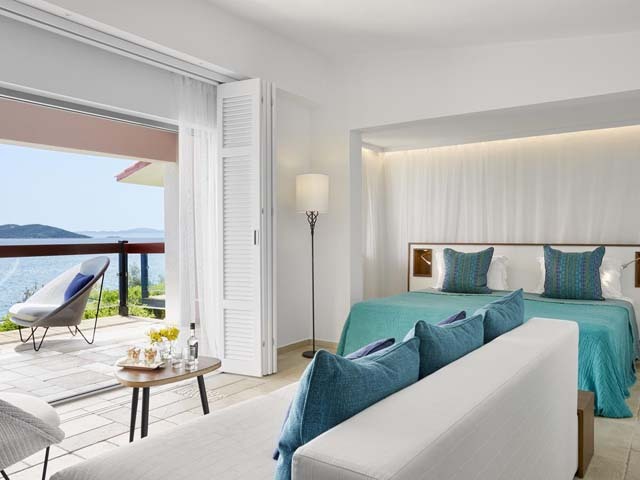 Private pool, Jacuzzi, Beach, the choice is yours : Whether you decide to cool off in your private pool or Jacuzzi or take a walk down the golden sandy beach of Ouranoupolis, you can find it all in Halkidiki. All you have to do is decide. 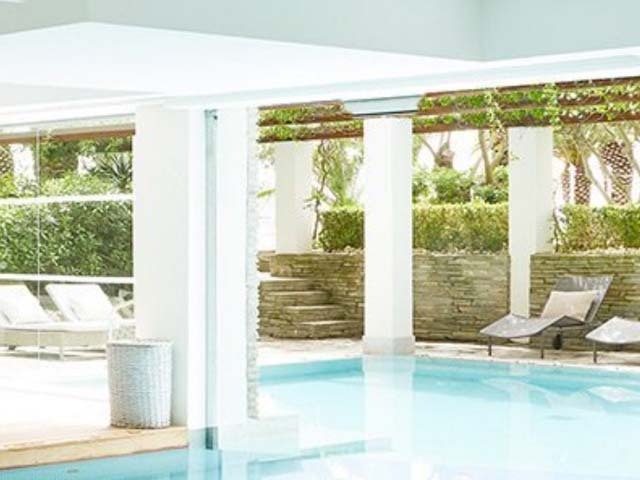 Private pool, Jacuzzi, beach … makes you wish life was full of such dilemmas doesn’t it? 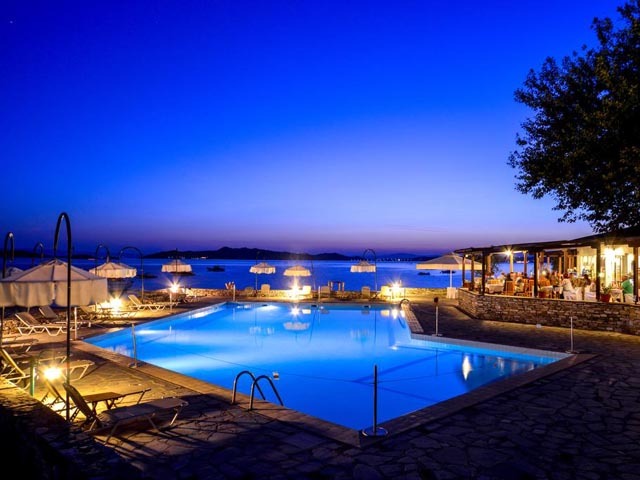 Eagles Palace is one of the most breathtaking Halkidiki. 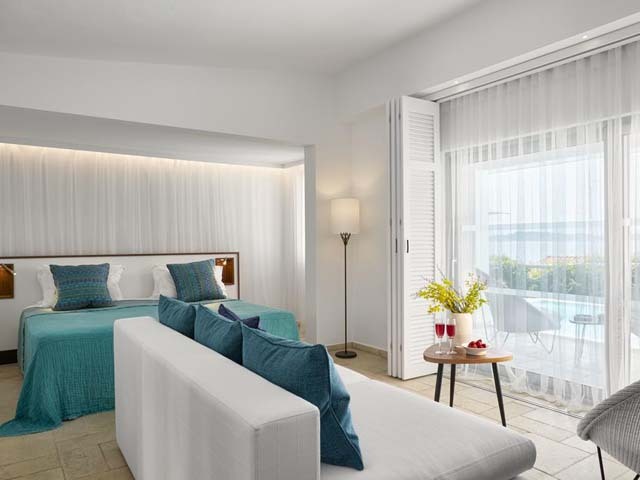 The 164 sea view and sea front rooms, luxury Suites, suites with pool and bungalows are designed for elegant living and pay tribute to the mesmerizing view. 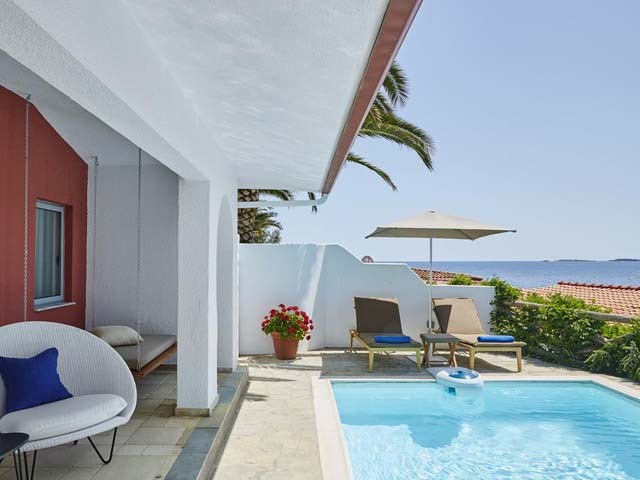 The luxury suites and suites with pool offer complete privacy, direct access to the beach and promise a unique experience as your gaze flows away to the mystique presence of Mount Athos, the sandy beach and the mesmerizing sea front. 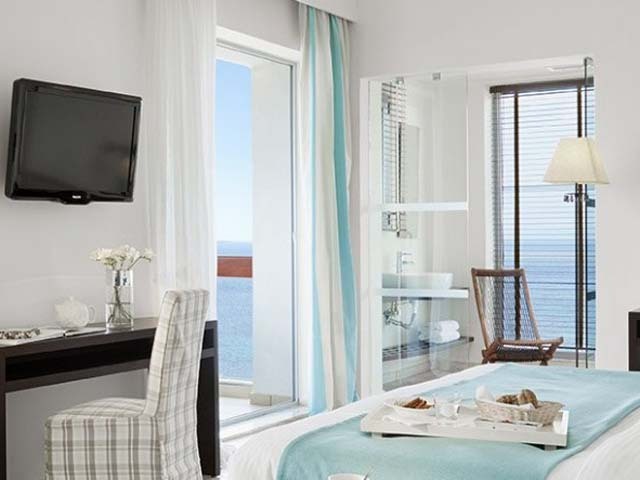 Feel the energy of Greece in all its glory in this superb Halkidiki sea view hotel. 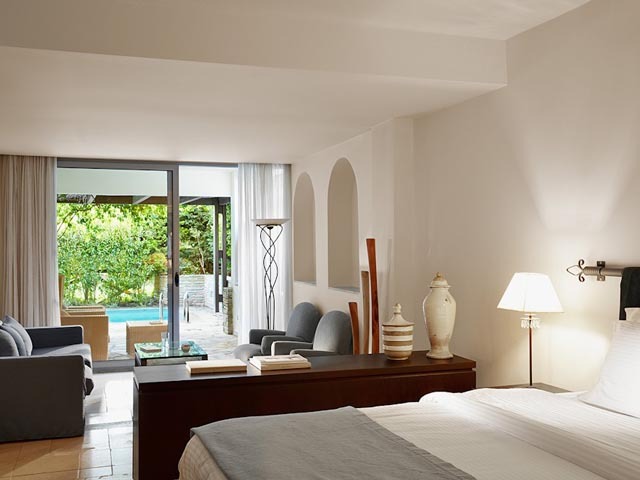 All our Sea View and Sea Front rooms, luxury Suites, Suites with pool and Bungalows, offer luxurious accommodation. They propose room service throughout the day, breakfast, lunch, dinner in the room, medical services, wireless Internet, satellite TV, direct call operator, radio, safe, mini bar, air condition, bath amenities, bathrobe, beach towels, hairdryer, butler bath menu, laundry services, baby cot (on request). The magnificent view of Ouranoupolis, Halkidiki, Greece is bound to leave you enchanted, and it also makes for a perfect setting for long lazy walks. 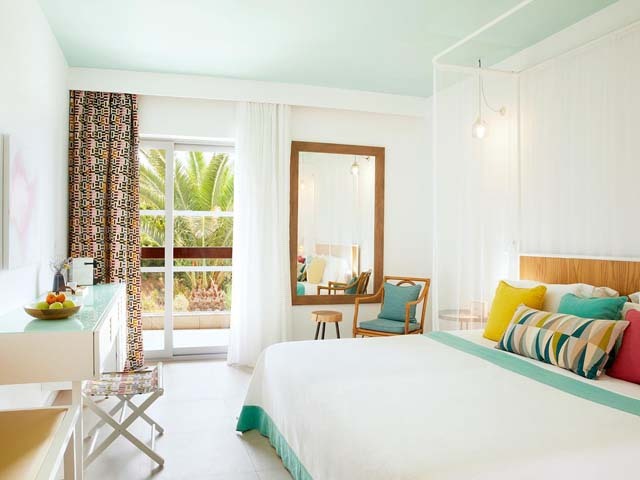 From Sea Front Suites to Grand Suites, all Eagles Palace accommodations are characterized by luxury and elegance. Whether you choose to stay in our Sea Front or Sea View Rooms and Suites, our Suites with private pool and Jacuzzi, or even the sublime Grand Suites, you are bound to have an unforgettable experience. 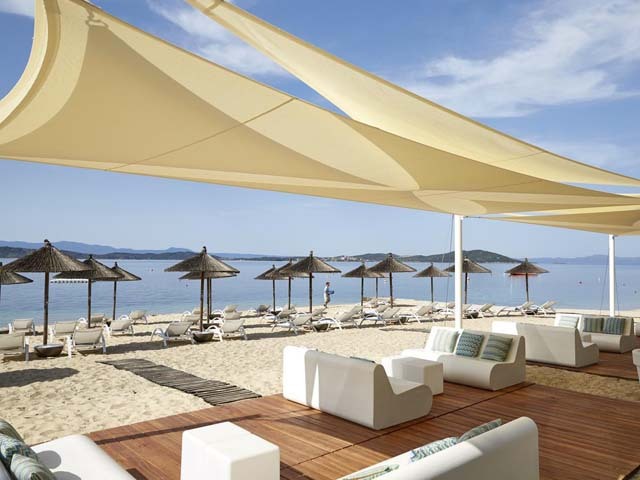 The magnificent village of Ouranoupolis, the aura of Halkidiki and the glorious sun of Greece combined with the elegant surroundings is what makes our Beach hotel truly a majestic vacationing experience. 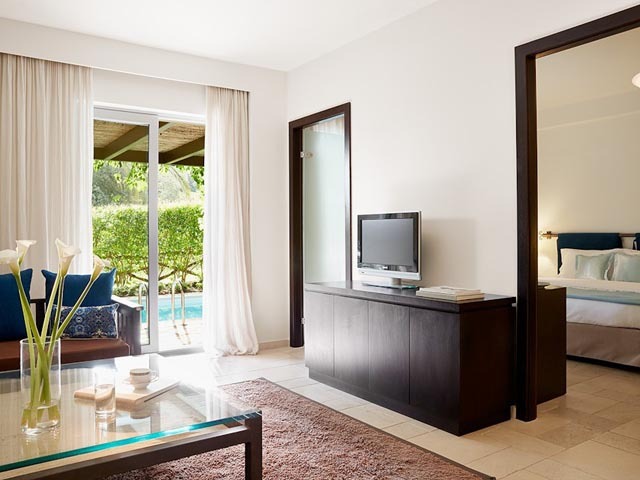 All our suites are equipped with Nespresso coffee machines and LCD TV. Catering for all tastes and occasions, the divine creations in the restaurants of Eagles Palace are the envy of every connoisseur. Tete-a-tete dining with candle light in the main restaurant "Melathron" or at the garden restaurant and the Pool Tavern in magical surroundings, you can indulge in local and international dishes. Melathron: Outdoor and indoor, open and easy, Melathron brings a stylish-but-laid back attitude to dining for breakfast and dinner delivering the finest taste temptations. Eagles Cafe: Centerpiece of the lobby with its own fireplace offering any time of the day teas, coffees, pastries & light snacks. 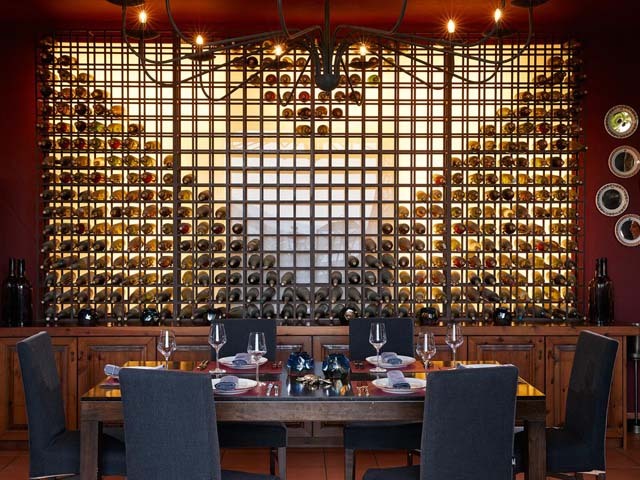 Kamares: An ultimate dining experience on a breathtaking sunset terrace or the monastery-like indoors. 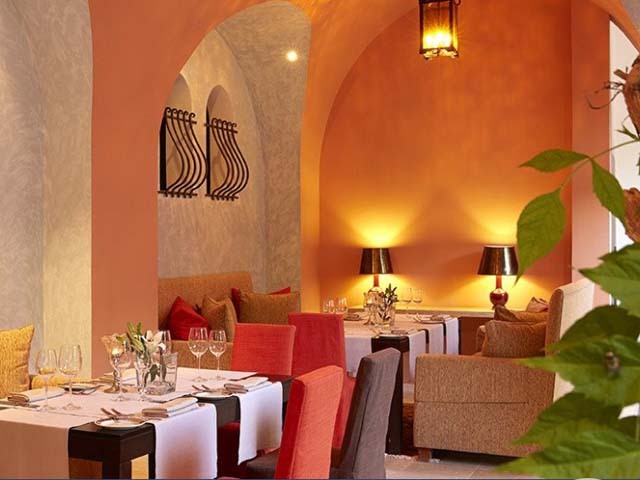 The master chef and his team deliver temptation at every turn with delicious cuisine based on the Mediterranean tradition and fresh local produce. 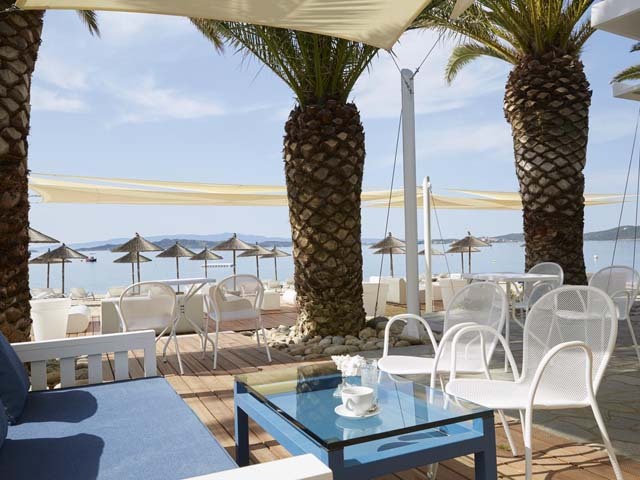 Armyra by the pool: Outdoors, on the water edge savor the finest seafood under the skies, prepared by the inspired Michelin star awarded Chef L. Lazarou. Armyra pool bar: Swim up bar, the landmark of the pool. A summer dream for everybody. 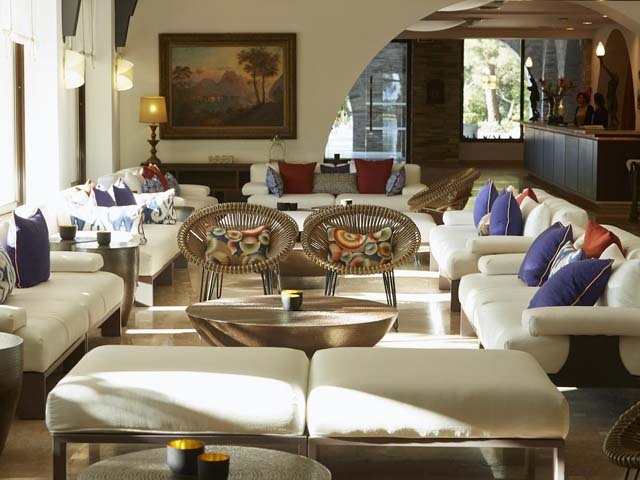 Eagles Club: Focuses on sunsets, cocktails and live music evenings under the starlit sky. 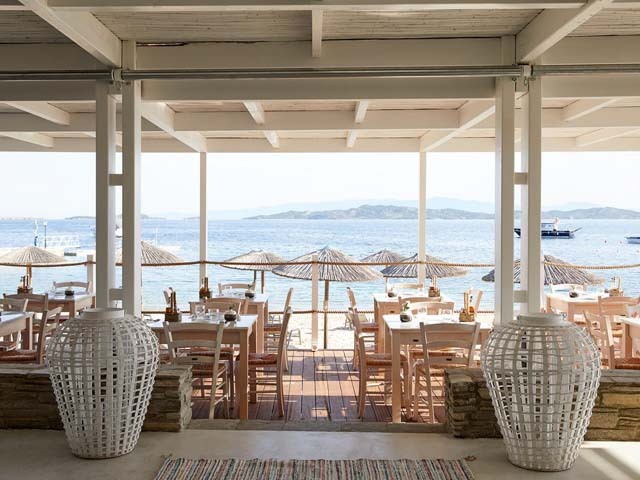 Ammos beach bar: You don't have to put on any shoes! Service on the beach by just lifting a small blue flag. 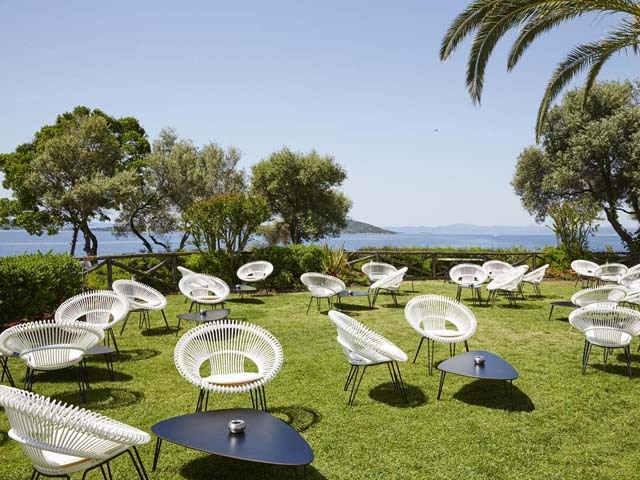 Eden Bar: Designed for the hot summer nights, Eden hosts most of the cultural, open-air and romantic music events planned for the season. For those who like the utmost intimacy and escapism why not dine in? Available 24 hours a day. 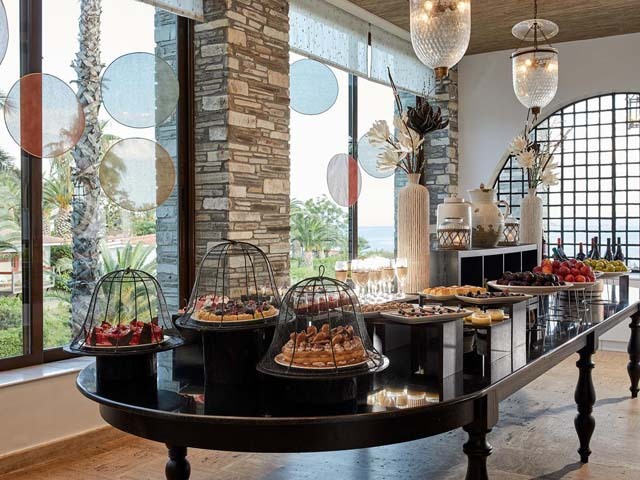 At "Melathron Restaurant", a restaurant serving international cuisine, you can enjoy an American- or Mediterranean-style breakfast and on Sundays try our Champagne Breakfast, now a firm fixture on the weekly calendar. 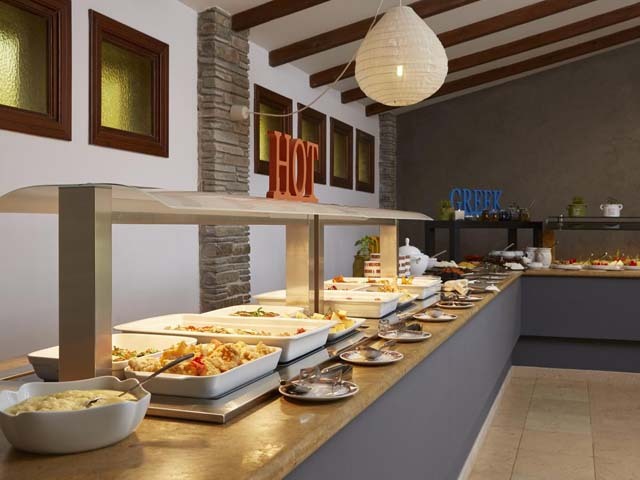 A mixture of dishes from the Small Luxury Hotels Outstanding Recipes and traditional dishes from Mt. Athos and Halkidiki in general prepared with loving care by chef Leonidas Iordanis are available during both breakfast and dinner. 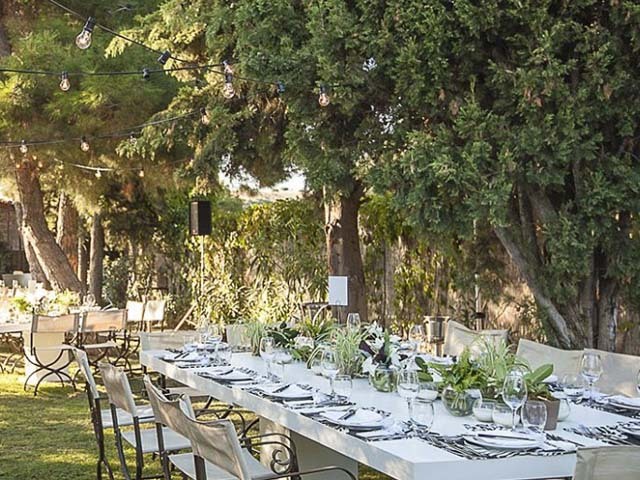 This year, there will be a series of theme evenings entitled Action Kitchen (outdoor kitchen) featuring Mediterranean and Italian specialties where guests play the leading role. Open from 07:00 to 10:30 and from 19:00 to 21:30. As an added convenience to our gests, early breakfast is served from 06:30 to 07:00. The "Eagles Cafe" is located on the hotel patio where you can enjoy the sunrise and sunset under the hotel arches. Authentic coffees and teas from a wide selection accompanied by our range of homemade deserts are offered. Open from 10:00 to 19:00. 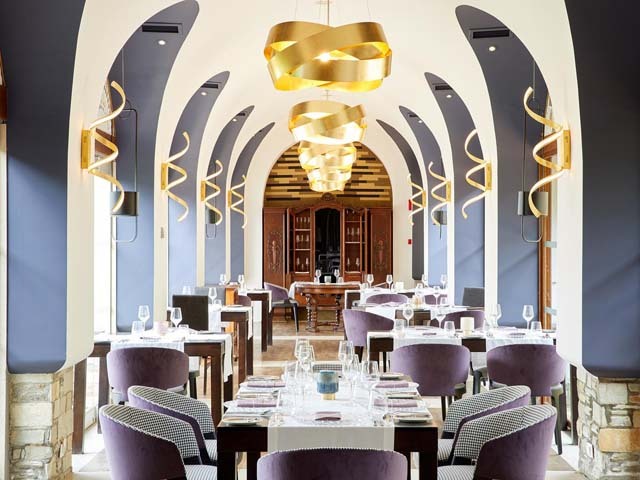 "Kamares" is the Eagles Palace Hotel's new a la carte gourmet restaurant. 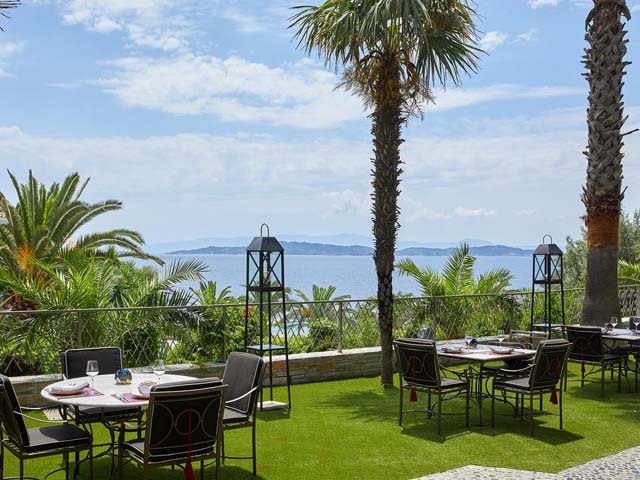 Located within the courtyards of the Eagles Palace Hotel, it has a view of the enchanting Ammouliani Island, while the restaurant has been recently extended with a wonderful veranda. The floor is made of transparent glass allowing guests to look down at the flora and the sand below. 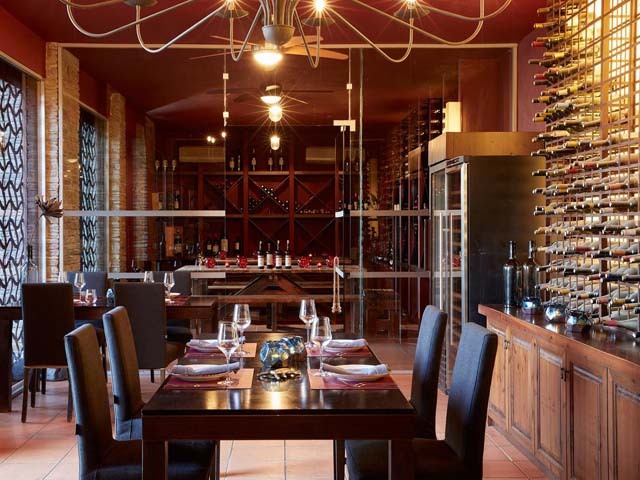 The cuisine could be characterized as fusion-gourmet with hints of both European and Mediterranean cuisine. We unhesitatingly recommend the restaurant's uniquely tempting dishes that will stimulate your palate such as smoked eel with pomegranate, fried ice cream and rice pudding with mastic gum sauce. 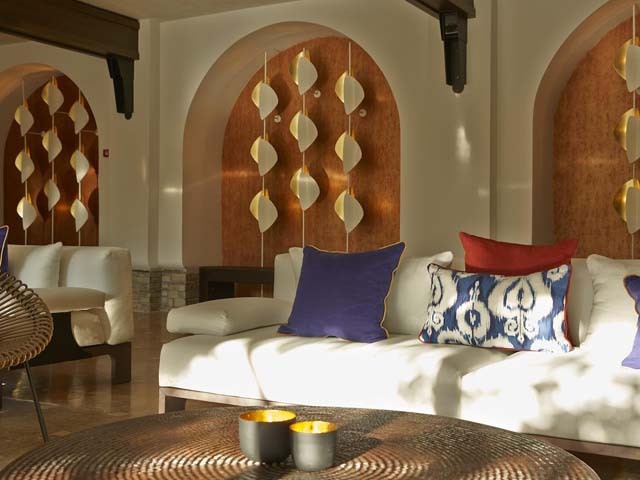 At Kamares, the enchanting landscape blends harmoniously into the discreet yet luxurious decor. Open from 13:00 to 16:00 and from 19:30 to 23:00. 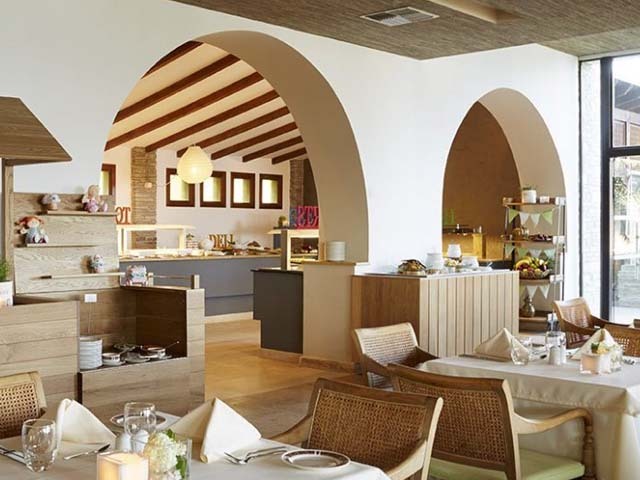 "Almyra" is our Greek tavern by the pool, highly recommended for fans of Greek cuisine where the emphasis is on fresh fish, grilled meats and traditional seafood-based mezes. 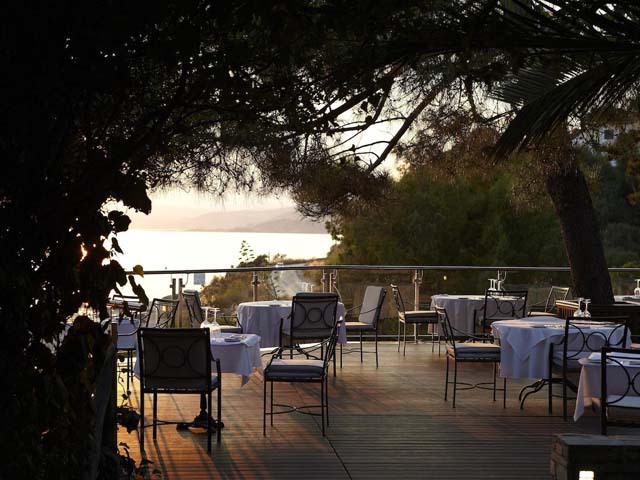 This year, Almyra's menu is being prepared by the Chef Lefteris Lazarou, who is awarded with two Michelin Stars. Open from 12:00 to 17:00. During July and August Almyra is also open in the evenings from 20:00 to 23:30. 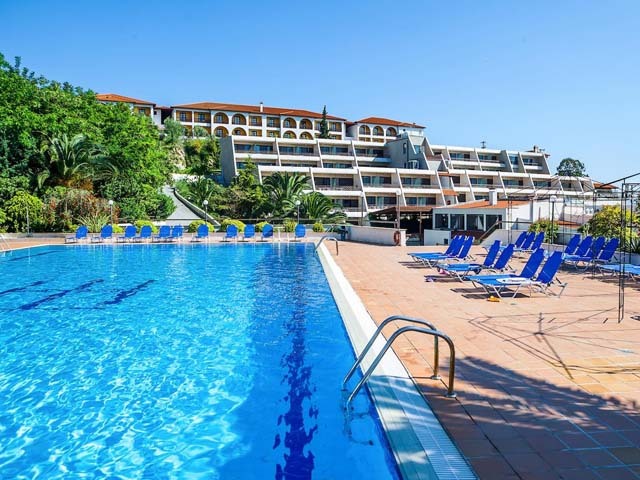 The "Almyra Pool Bar" is ideal for a break from swimming or sunbathing where you can enjoy a cool drink. Open from 10:00 to 18:00. On hot summer nights the bar stays open until 24:00. The "Eagles Club" is located right in the very heart of the hotel. 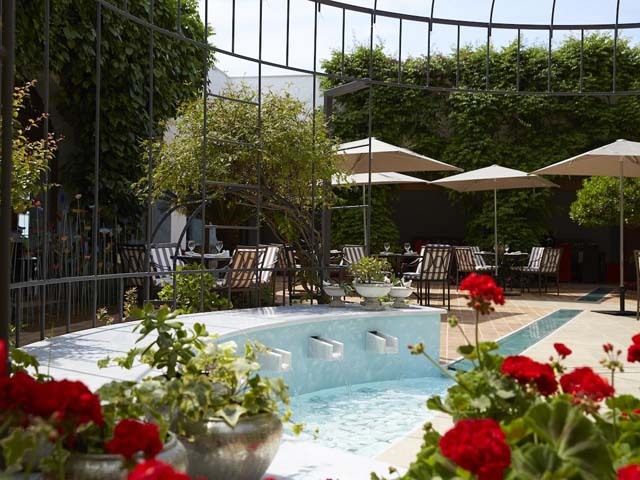 It is ideal for relaxing in the evening while enjoying a refreshing cocktail, aperitif, drink or wine. Unique finger foods are also served. Open from 18:00 to late. 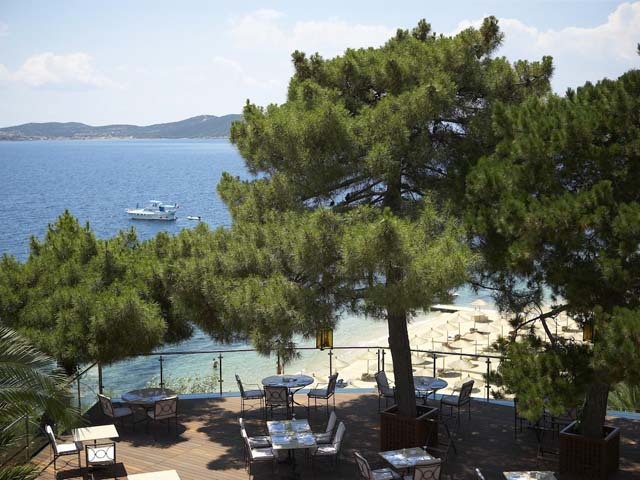 The "Beach Bar" is a refreshing summer place, where you can enjoy light snacks, a variety of beers or a drink with the accompaniment of well-known tunes. When you want to place an order, simply raise the blue flag located next to you. Open from 11:00 to 18:00. 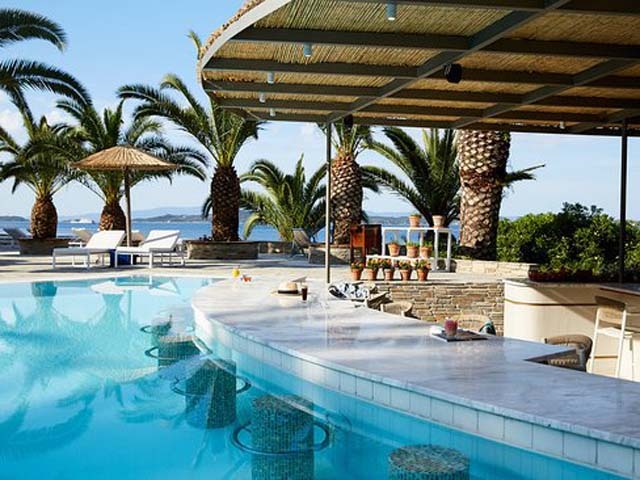 The "Eden Wine Bar" is located over the pool and is highly popular with fans of fine wines from all over Greece. Open from 21:00 to 01:00. Open:April-October...Eagles Palace is a luxurious (5 stars) resort hotel of 100 rooms and 64 suites and bungalows – several of the suites having private pools – that is situated in a picturesque location in the peninsula of Athos only 4 kilometres away from Ouranoupolis Halkidiki and 110 km from the “MACEDONIA” airport of Thessaloniki. 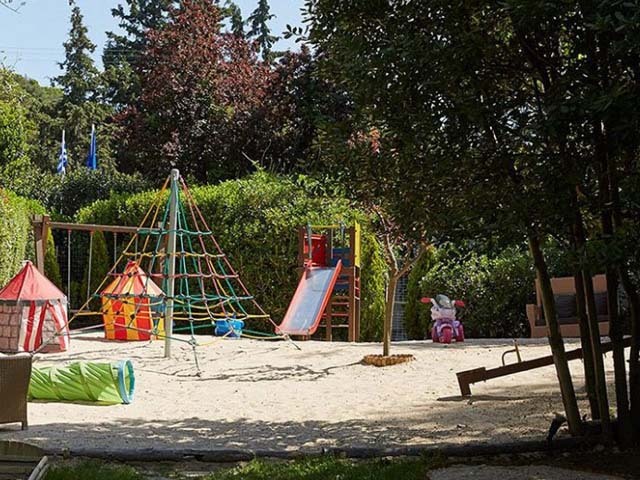 Its private idyllic beach is awarded with the Blue Flag of Europe and has service.